Finance and the British state are mutually embedded to the point that it can be hard to tell where one stops and the other starts. Here, Tamasin Cave of Spinwatch gives us a brief tour of the tangled web that is public life in the UK. Flickr/Dominic Alves. Some rights reserved. Lord Sassoon, until January this year economic secretary to the Treasury in the UK government, is a man who bestrides the worlds of government and finance. In 2012 he delivered the inaugural summer lecture of the British Bankers Association. He began by thanking the outgoing head of the BBA, Angela Knight, for her services to Britain : “Angela, the country owes you a debt of gratitude”, he said, praising her for her steady, calm presence during the Northern Rock crisis of 2007, for her masterful lobbying to defend the City in Brussels, and for rebuilding banking’s relationship with the UK government and with the industry’s customers. Sassoon went on to explain how, as early as 2003, the Bank of England financial stability team had already identified “some of the key issues that would be at the heart of the crisis, for example, the over reliance of Northern Rock on wholesale funding, the extent of Bradford and Bingley’s exposure to the buy-to-let market, RBS’s increasing exposures in Germany and elsewhere”. He talked of how in 2005, Andrew Large, who was deputy governor of financial stability at the Bank, was “ringing alarm bells’, one of two people identified by Sassoon at “the top global table that were standing out against the orthodoxy”. “Sadly we all listened but took no action,” said Sassoon. According to Lord Sassoon, this is a government “utterly committed to ensuring the UK is open to business and that London continues to thrive as a global economic centre… A government with a number of bankers in its ranks, led by a Prime Minister who is proud to say he comes from a stock broking family”. Sassoon’s remarks echo the sentiments of the Labour Party’s Ed Balls a few years earlier. In 2006 Ed Balls, then the Economic Secretary to the UK Treasury, told an audience at the BBA that “when the WorldCom accounting scandal broke in the US, we resisted pressures from commentators for a regulatory crackdown”. He went on to say that the UK government had a “specific and clear interest” in safeguarding “the light touch and proportionate regulatory regime that has made London a magnet for international business”. 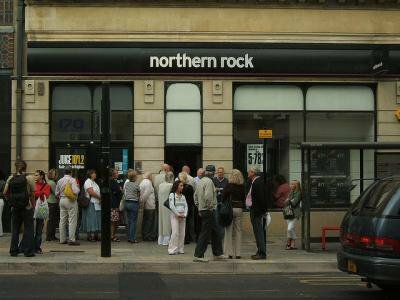 Of course it was this same “light touch” regulatory regime that allowed Northern Rock, Bradford and Bingley and RBS – finance as a whole – to engage in a frenzy of risky business. Lord Sassoon is only one of many former bankers to have served in the current UK government. In the current Cabinet both David Laws, a Liberal Democrat Minister for Schools, and Oliver Letwin, a Conservative Minister at the Cabinet Office, worked in investment banking before they entered Parliament. In fact the UK comes second only to Switzerland for the number of people moving through the “revolving door” between the finance sector and officialdom according to a report by the OECD . Baron Green of Hurstpierpoint, previously Chairman of HSBC, is currently a Minister at both the Department for Business Enterprise and Skills and the Foreign and Commonwealth Office. In May 2013 the former Chairman of Goldman Sachs, Richard Sharp, joined the Bank of England’s Financial Policy Committee, the new watchdog set up to protect the public from another financial meltdown . Two months later another former Goldman Sachs banker, Mark Carney, became the governor of the same institution. Current and former employees of the investment bank also known as “the vampire squid” have donated £8.8million to Britain’s political parties in the last decade. Sharp himself donated £400,000 during that period. And this is only a fraction of what the sector gives. In 2011, hedge funds, financiers and private equity made up over a quarter of Conservative Party funding, with the City as a whole contributing more than half of its donated income. The global accountancy firms – the so-called “Big Four”, PWC, KPMG, Deloitte and Ernst & Young – are also deeply embedded in the British state. They earn hundreds of millions of pounds a year from government business while loaning their staff to government departments and political parties, where they advise on everything from tax law to privatisation programmes. All four companies insist that their involvement is limited to providing “technical insight” into proposed polices. But at the same time some actively lobby government for changes in tax legislation. Ernst & Young’s Tax Policy Development team, for example, says that it “works with clients to develop proposals for changes in tax policy that can be taken to government”. “Unlike a traditional lobbying service,” the pitch reads, Ernst & Young’s team will work with its clients to develop “technical policy options in a form that is used inside Government today”. Put simply, this means it uses its knowledge of the workings of government to lobby for clients. This, it says, means that tax changes can be “implemented with the minimum of delay”, and makes sure that “the concerns of policy-makers are addressed”. This gives proposed tax breaks “the maximum chance of adoption”. In this respect, the insider status of E&Y is clearly of benefit to its clients. The advantages to clients of lobbying for tax policy changes – as opposed to tax planning – are clearly explained in Ernst & Young’s pitch: “In an era where the government is focusing on actively identifying and countering tax avoidance, and where there has been considerable media coverage on particular “tax avoiders”, policy development offers a low risk alternative.” In other words, “policy development” – lobbying for changes in the law – offers its corporate clients a less risky way to reduce their tax bill. Incidentally, Ernst & Young’s lobbying team would not be covered by the government’s proposed register of lobbyists, which is making its way through Parliament. If it passes in its current form, the register will include only a tiny fraction – 5 per cent on some estimates – of the £2 billion UK lobbying industry . Former politicians beat a well-trodden path in the other direction. Tony Blair took a job with JP Morgan when he left Downing Street. He joins a group of politicians-turned-financiers too numerous to name here. But some idea of the scale of what’s happening can be grasped if we restrict ourselves to former Ministers in the Department of Health during the New Labour years. Alan Milburn is an advisor to Bridgepoint, a private equity firm and PWC. Norman Warner has been an adviser to Apax Partners, another private equity firm. And Patricia Hewitt has advised Cinven, yet another private equity group. And then there is the current Prime Minister. As Lord Sassoon notes, David Cameron comes from a stock broking family. This underplays things a little. His father co-founded the Panamanian investment company Blairmore Holdings and was the chairman of Close International Asset Management, based in Jersey . Unlike Tony Blair, the British Prime Minister from 1997 to 2007, who only began to make extensive use of tax havens on leaving office, Cameron is part of an offshore dynasty. Blairmore indeed. Through the revolving door that takes politicians into lucrative employment and financiers into government, through party donations, and through the informal mechanisms of finance’s lavish hospitality, the political class is integrated with the sector to the point where it can be difficult to see where one stops and the other starts. Ambitious politicians have been eager to associate with investment bankers and others from the sector. There’s money to be made, of course, but also the seductive sense that they are in the room with the people who understand how the world really works, with the winners. Billions in taxpayers’ money seems like a small price to pay for such company. And the pervasive secrecy and clannishness of British politics only compounds the problem. We do not know, for example, how much money finance contributes to the free market think tanks that enjoy such sympathetic coverage in the UK media. Given the degree of overlap, and the shared commitment to London as a world financial centre, the organised lobbies for finance do not have to spend much time persuading the government to promote their interests. Instead, in the words of the then-Chancellor and later Prime Minister Gordon Brown, they work together to “promote the City and its financial service expertise throughout the world”. It is hardly surprising that the few warnings that reached Sassoon’s “global top table” went unheeded. By then the British government no longer saw the financial sector as one lobby among others. It saw itself as a lobbyist for finance. This was, and is, a recipe for trouble. To find out more about the Tax Justice Network, to subscribe to Tax Justice Focus, or to read The Finance Curse e-book, click here.